10ml Bacteriostatic Water,Bac Water,Bacteriostatic Water UK. 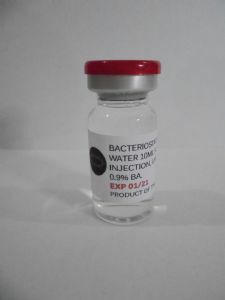 1 x 10 ml Bacteriostatic water for injection is sterile non-pyrogenic water that contains 0.9% benzyl alcohol (9mg/mL), which is added as a bacteriostatic preservative. This preparation of sterile water and benzyl alcohol (BnOH) allows repeated withdrawals to be made from a single vial. Bacteriostatic Water UK.